Started in 2005, Kilchoman was the first new distillery on Islay in nearly 125 years. More importantly, the distillery crafted a distinctive “Islay character” style that challenged assumptions that quality required age. Recently in Mumbai, I had the pleasure of chatting with Kilchoman’s founder Anthony Willis in the Spirited Stories tent at The Vault Biennale, where he shared with pride their journey into the world of whisky making. There will be more on that another time, for now let’s focus the whisky! This particular single cask release featured as the 5th whisky sampled early January 2019 in Dubai. In keeping with our “unique” theme, this bottle was one of only 42 produced to be sold from the Kilchoman distillery shop. It is approximately 5 years of age and according to Whisky Base, last sold for EUR 161. 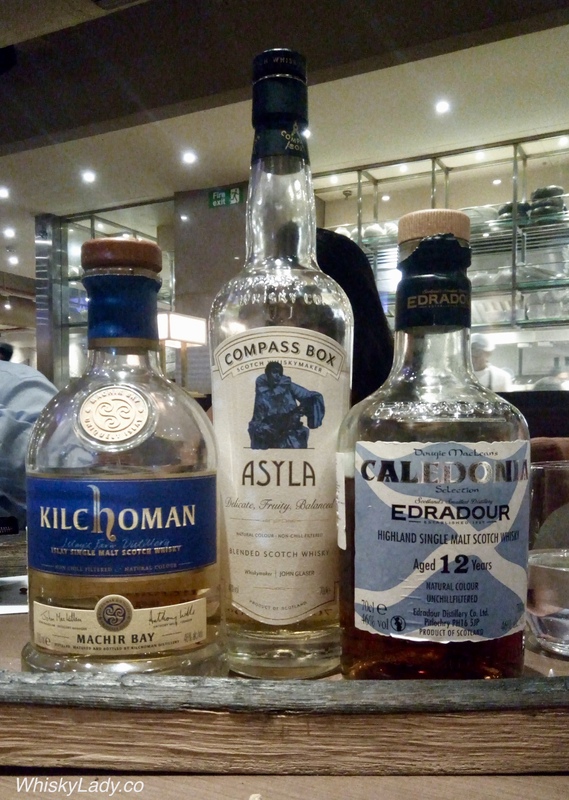 For a few of my sampling companions, this was simply too powerful and peaty for their palate – which is perfectly fine as half the fun of tasting a range of whiskies is discovering your personal preferences. That said, moving to a fresh pour of a cask strength at nearly 60% after the Longmorn 25 year or Strathclyde 38 year was certainly a shift in approach! For these gents, perhaps something like the rich fruity Kilchoman Sanaig 46% might have been a more natural progression in our sampling journey. For a strong expression like this, having the right setting, time to ease into its personality, slowing down and settling in, makes all the difference. 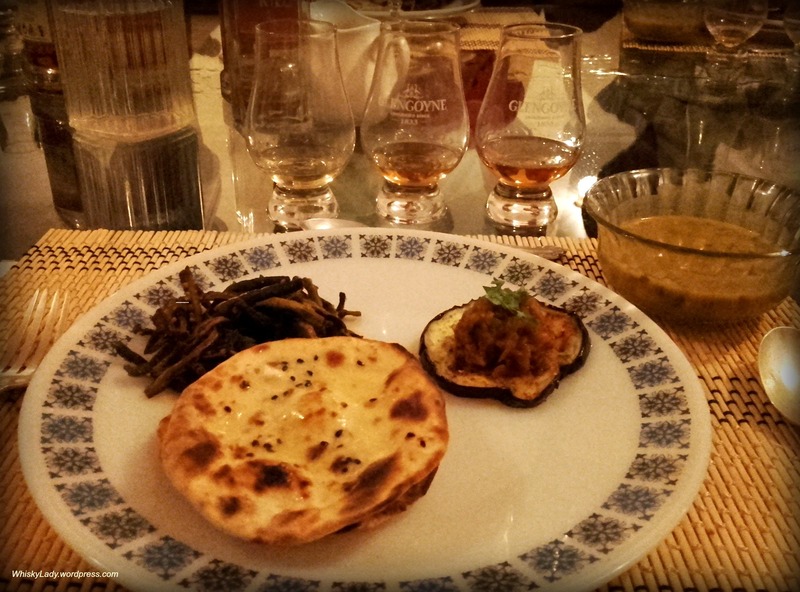 Palate: Soft peaty aromas with overtones of sherry, slightly dry on the palate. 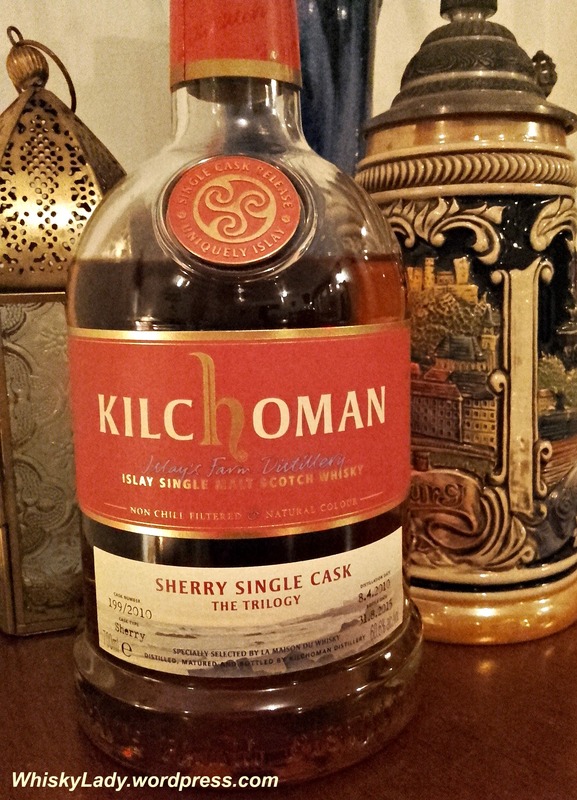 A good example of Kilchoman in sherry wood. 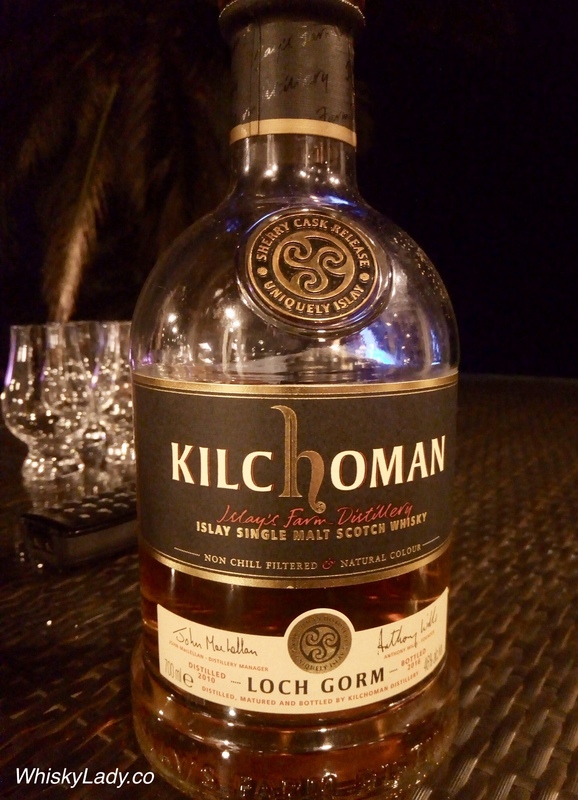 Last in our Whisky Ladies “Smoky Night” evening was this Islay – Kilchoman’s full sherry expression – Loch Gorm. For many, this was proper peat and sweet dram – a full, robust and satisfying whisky. More than anything else, this evening was a terrific reminder that tasting order and environment makes all the difference! After the rather disappointing Bunnahabhain, this Loch Gorm was “Oh yeah!” The peat hit just the right note and the sweet was also quite welcome. Whereas for the Bombay Malt and Cigar lads, we sampled this same whisky after a trio of unpeated sherry drams. And the one just before – the BenRiach – was particularly spectacular. So when we got to the Loch Gorm it was a bit of a shock to the palate. 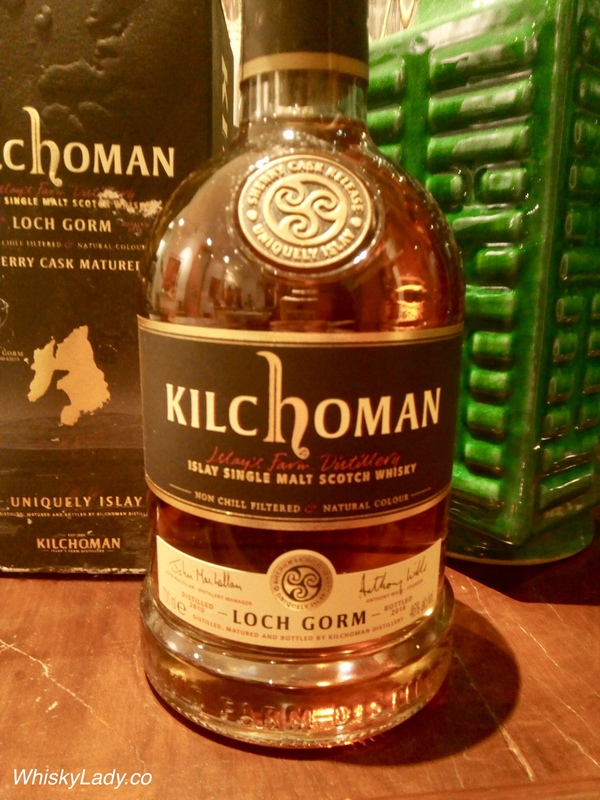 And what do the Kilchoman folks have to say about Loch Gorm? Nose – Orange peel, cloves, caramel and mixed spice with waves of fruit cake and citrus. Finish – Mouth-filling peat smoke, lasting tropical sweetness, toffee and rich dried fruit. It is common for distilleries to use a variety of sherry producers but for our consistent quality and character, it is vital that we source them all from just one bodega. We select a combination of sherry butts and hogsheads from Jose Miguel Martin that provides two separate styles of maturation. These ex-oloroso sherry casks impart a combination of heavy sherry notes, spicy dark chocolate, rich fruits and burnt sugar. This balances beautifully with the Kilchoman peat smoke and citrus fruits found within our farm crafted spirit. For us, the results worked! 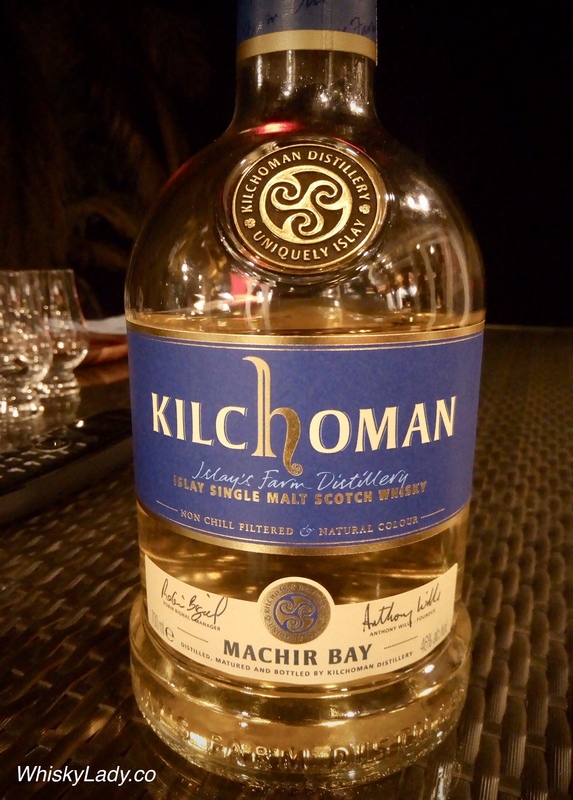 Next up in our Smokey Night with the Whisky Ladies was a familiar friend – Kilchoman’s Machir Bay. While I may be on sampling opportunity No 5 (or is it 6) for this particular expression, it was the 1st time for the Whisky Ladies and in perfect keeping with our smokey theme. Did we enjoy it? Absolutely yes! In terms of the cask, it predominantly relies on ex-Bourbon with approx 20% ex-Sherry. 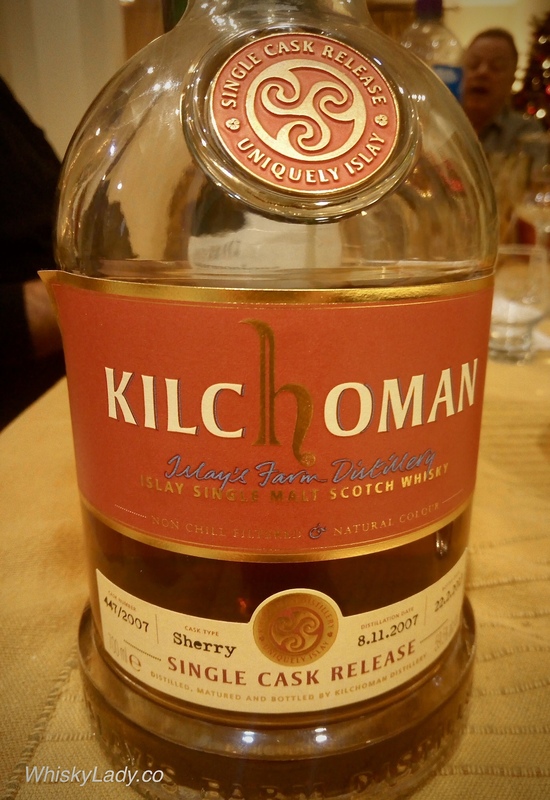 Over the years I’ve had some interesting experiences with Kilchoman. However the last bottle that was actually mine to keep (as opposed to helping others source) was the Coull Point which was my ‘daily dram’ of choice for as long as it lasted back in mid 2015! 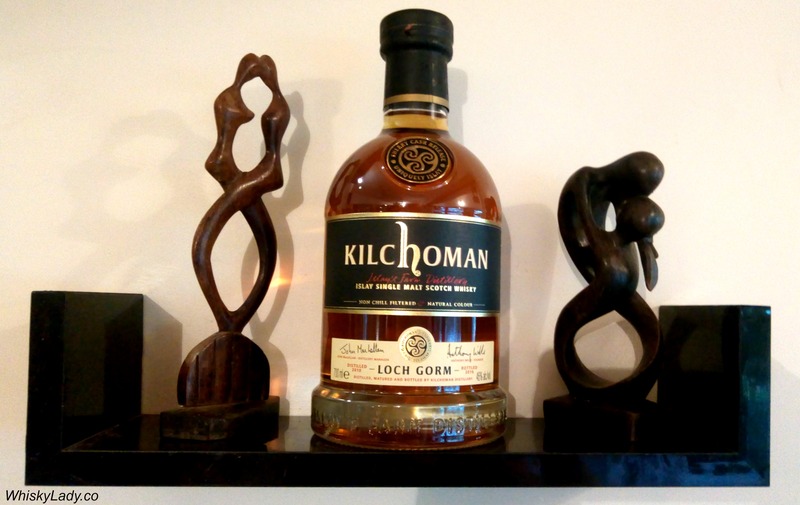 So when Islay Storm showed up as part of an Islay tasting flight at The Single Cask early 2017, with an unmistakable ‘stamp’ of Kilchoman, I vowed it was time to acquire another bottle for home. Enter the Loch Gorm 100% sherry matured… sourced from the UK. 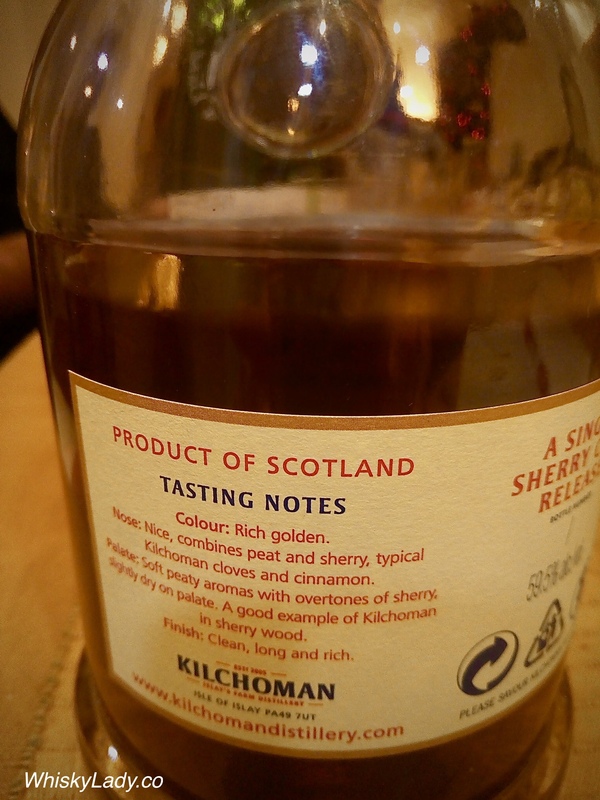 Earlier experiences with Kilchoman’s peat and full sherry sweet were all cask strength with an Olorosso and Pedro Ximenez, so I looked forward to trying a ‘connoisseurs’ strength of 46%. After the absolutely stunning BenRiach, this was quite the change. Certainly as a contrast, it succeeded. However as a whisky for the gents to relax, unwind and enjoy… not that evening. Nose – It became much fruitier, rich chocolate, mince pie, vanilla and even, dare I say it, marshmallows? Finish – Long, cinnamon sweet with an unmistakable curl of smoke… almost sacred ash like… with a chaser of spice. I think it might be fun to revisit again with the Whisky Ladies as part of a Smokey Night… where the Loch Gorm will have some peaty Islay company! Named after a famously peaty loch overlooked by the distillery, Loch Gorm is the only fully ex-sherry cask matured release in our range. Since it’s first launch in 2012 a new edition of Loch Gorm has been released every year, each with it’s unique balance of sherry influence and maturity. Bottlings are differentiated by distillation and bottling years printed on the label. Loch Gorm combines rich sherry fruits and spices with smouldering peat, cloves and lingering sweetness. That is exactly what happened one fine evening many months ago in Mumbai at KODE with Keshav Prakash featuring a trio from The Vault Fine Spirits Collection. 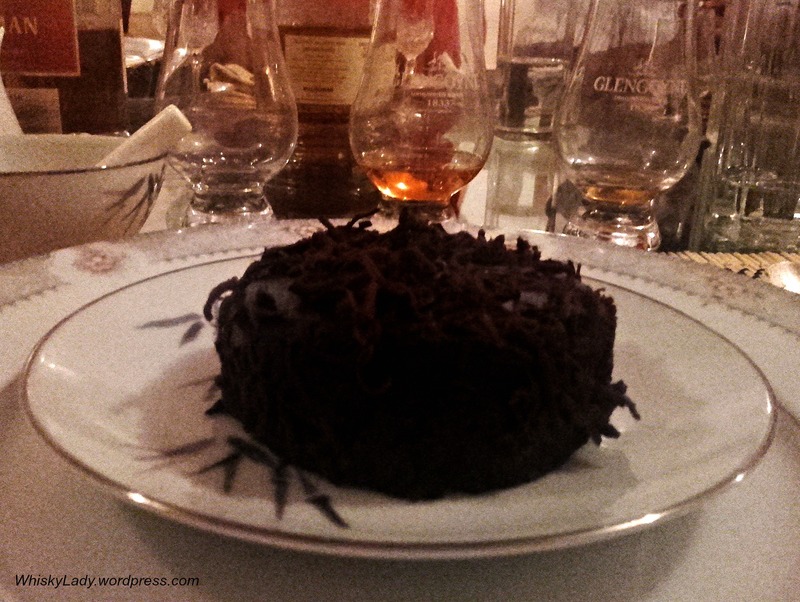 We began with a distinctly light then shifted gears completely to peat and closed with a sherry sweet. No serious tasting notes as this was purely an evening to quaff and enjoy with others who appreciate a good dram. 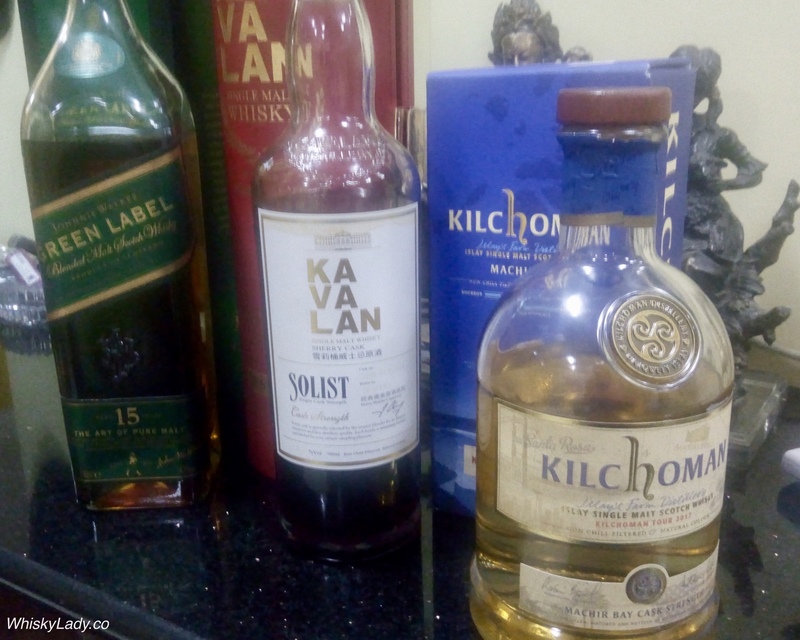 When we started our different whisky tasting clubs in Mumbai it was at a time where the offerings readily available beyond whiskies personally brought into the country were rather limited. Fast forward and today it is possible to have a respectable flight… right here in the city… for a price. That shared, we likely won’t see many single casks entering anytime soon… in part because to import requires donating a “sample” for testing purposes. When a product has only say 100 bottles in the world and to sell at best a handful in a particular state, it becomes impossible to justify such a “donation”. So while the more unusual limited edition specimens likely won’t show up anytime soon, the overall range is sufficient for those curious to be inducted into the world of single malts and whiskies in general. Which is exactly what we sat down to accomplish one fine evening at KODE in Mumbai early April. My sampling companions and I warned the waiter that we would be requesting different bottles, sniffing then selecting so to be patient with us. And they were. *Just in case you were wondering what all the “asterisk” mean… each of these bottles were brought into India thanks to Keshav Prakash with The Vault Fine Spirits. I’m incredibly proud of what Keshav and his team have achieved and have made a huge impact on the range now available in Mumbai. Thank you! PS It may seem like an insane quantity of whisky but keep in mind we were splitting 30 ml singles – focusing more on sniffing, swishing and savouring. 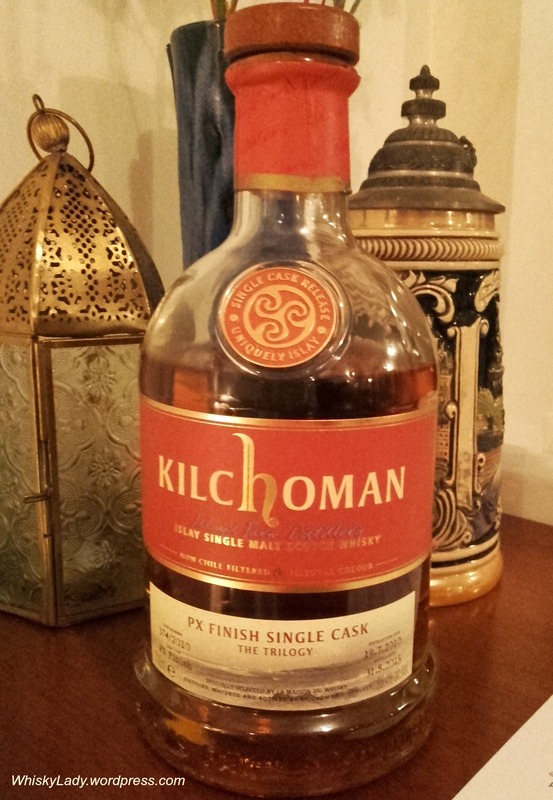 Last in our trilogy of familiar friends revisited was a whisky from Kilchoman… We sampled blind and truly struggled with this one. We should have guessed it… we really should have… but were flummoxed. We couldn’t quite determine was the distillery… We ran through all the usual suspects and dismissed as didn’t quite match our recollections of the “signature” peat style. There was no doubt this was a most enjoyable dram. And the reveal? Kilchoman?! Remarkable! 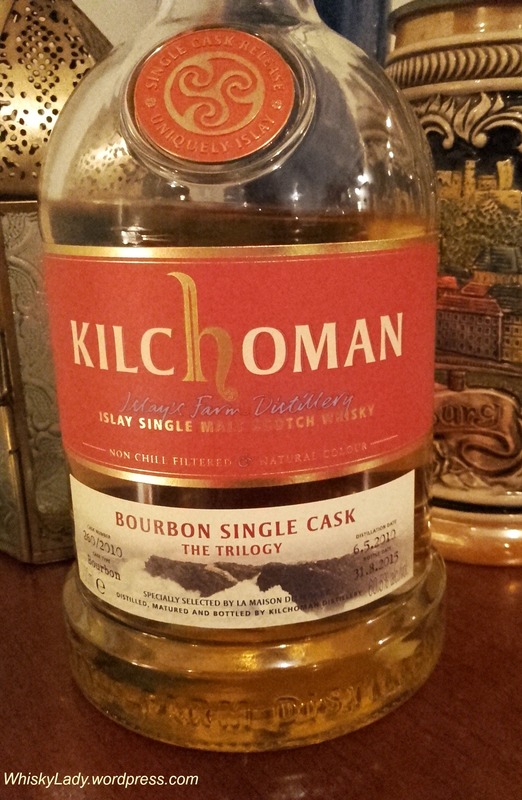 And no ordinary Kilchoman. It was picked up by our host in the US during the Kilchoman 2017 US Tour lead by Anthony Willis. We all puzzled a bit as the whisky didn’t display what we would consider typical characteristics of Machir Bay or the cask strength Kicholman’s we’ve sampled in the past. Bottom line, did we like it? Yes! For one, he simply had to go back home to compare the recent impression with the standard Machir Bay. He later reported back that indeed – the sacred ash quality that we discovered does have hint in the original – just one that hadn’t “registered” quite as strongly before. Proving that our memories and ways of storing different drams into different categories can be a bit blurrier than we think! One of the things I really appreciate about our original Mumbai tasting club is that our default is to sample blind. What the means is even something we thought we knew, we have an opportunity to rediscover. 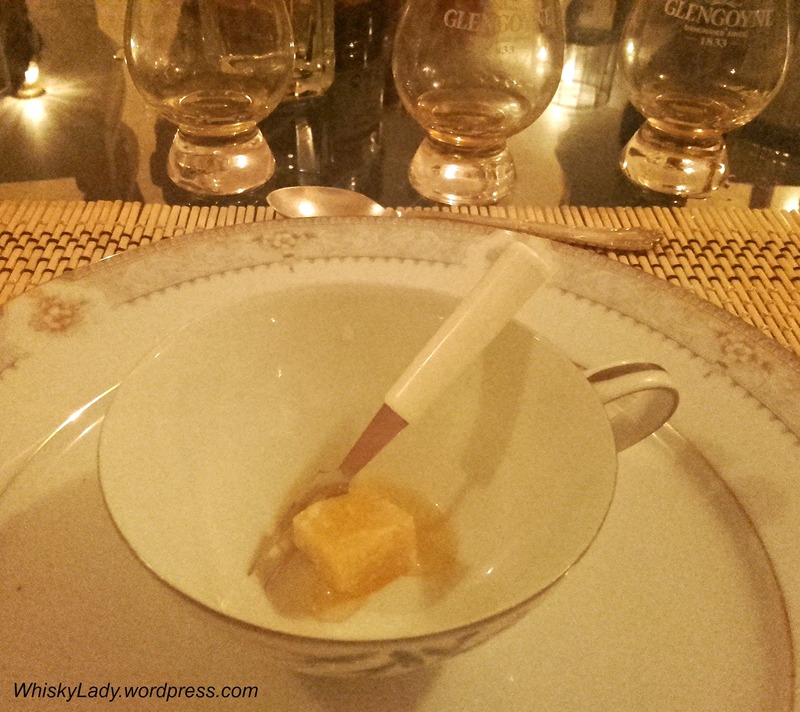 Which was exactly our hosts theme – to revisit whiskies we all know – or at least we thought we did! 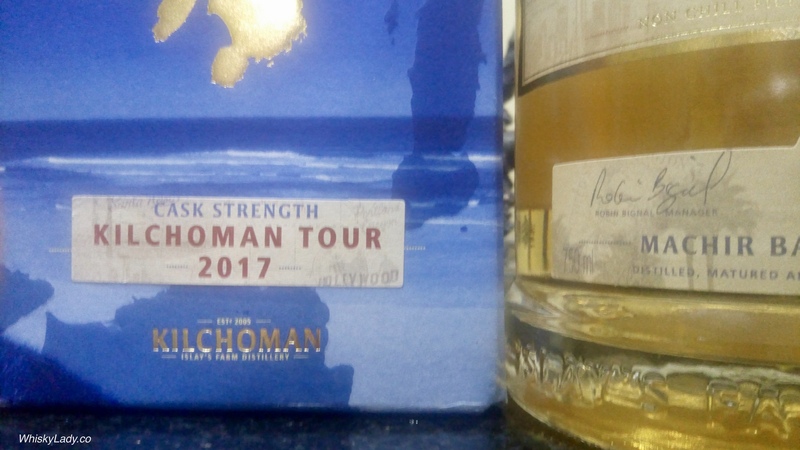 Kilchoman Machir Bay Cask Strength “Kilchoman 2017 Tour” 60% – Initially struck as quite “un-Kilchoman” like… but good! With a bonus of Amrut’s Fever Club Con-Fusion Batch No 1, 46%… what fun! Imagine you are a celebrated curator of special gourmet experiences. Picture your normal metier as a sommelier is to pair food with wine. Craft a unique evening pairing dishes with cask strength peated whiskies you have never tried before. And will not have an opportunity to sample until the evening itself. However, a true professional, on sampling the whiskies, he suggested reversing the PX with sherry or simply playing around with a sip of each to determine the best pairing. As we discovered, some of the assumptions made based on the tasting notes needed to be adjusted when faced with the reality of our experience with the different expressions. 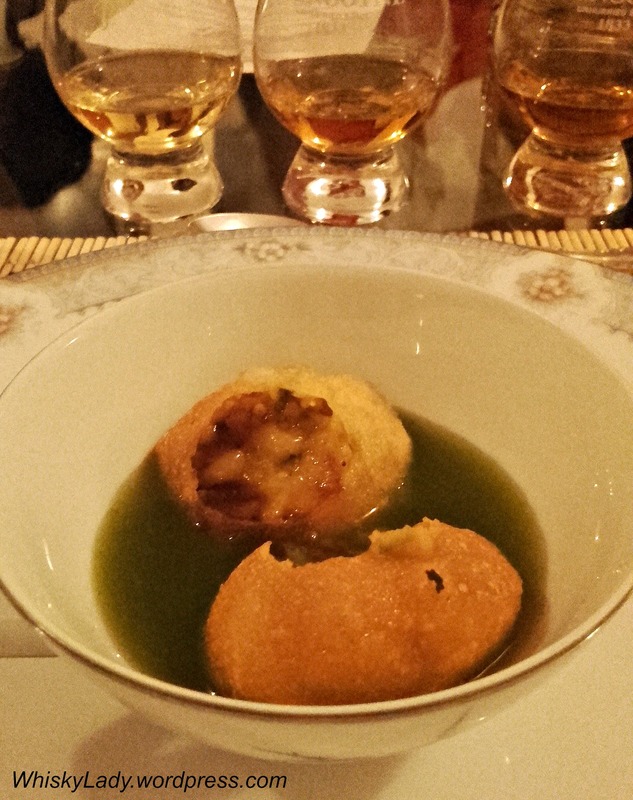 The pani puri was served with the warm chickpea sabra a surprise inside its crunchy pocket. It was hot and spicy with a sweet tangy tamarind. With the bourbon it ‘popped’ into a crazy tasty combination that left you craving more! 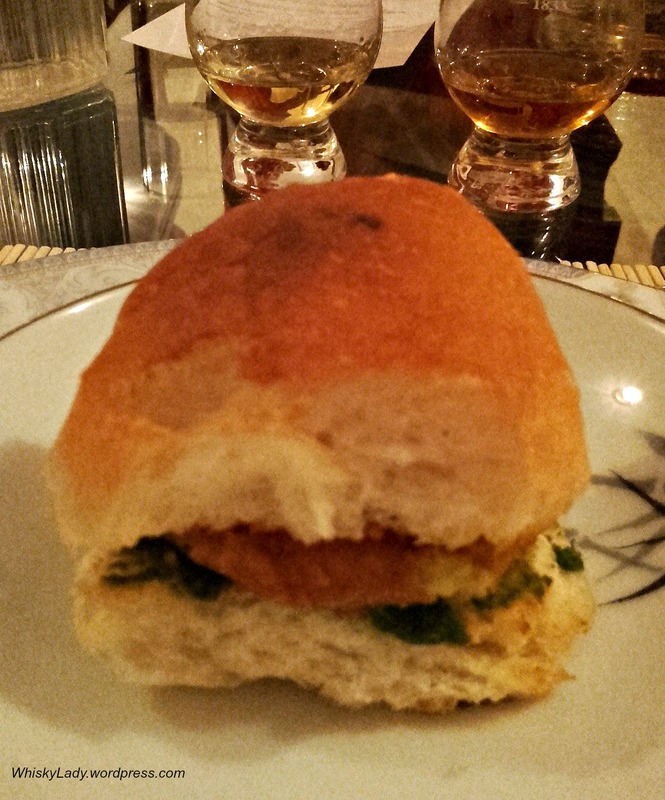 Which we shameless requested, to then contrast trying a delicious morsel with each whisky. 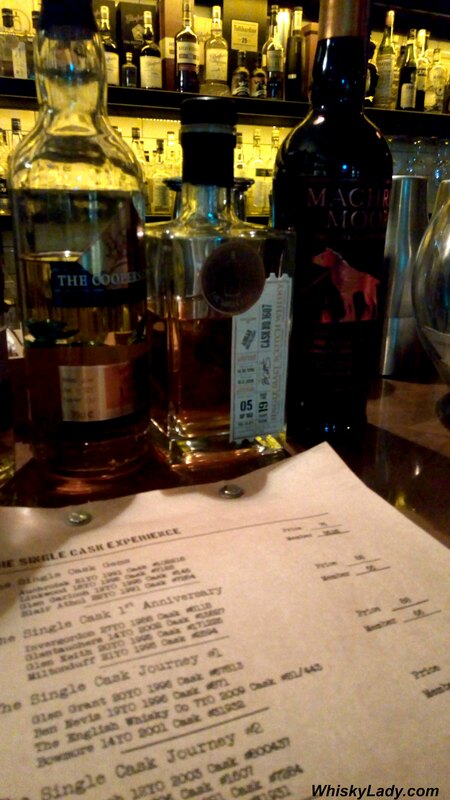 What we found is the bourbon brought out the spice more, the sherry the sweet side and the PX was juuuust right! And the vada pau? The dry coconut and home made bottle masala made this completely distinctive, standing out as much more than just the savoury snack so loved by Mumbaikars. While all sampled it first with the bourbon, it was when we crossed over to the PX that we discovered a spontaneous combustion of flavours in an absolutely fabulous pairing! I can’t speak for the carnivores, but the baingan bharta and bhajan was was a complete treat! To then have bhindi (bitter gourd) prepared my favourite way and a rich comforting home style mixed lentil? 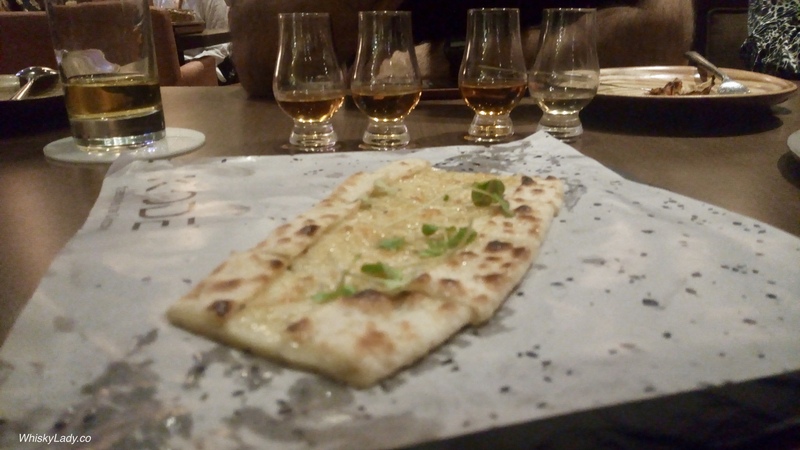 And hot buttered naan… Let’s just say my taste buds were doing a happy dance long before whisky was introduced…. What I found was different elements paired best with different whiskies. For the mixed dal? Definitely the sherry. For the bhindi? The PX. And the baingan, even the bourbon worked however it was back to the PX for most. 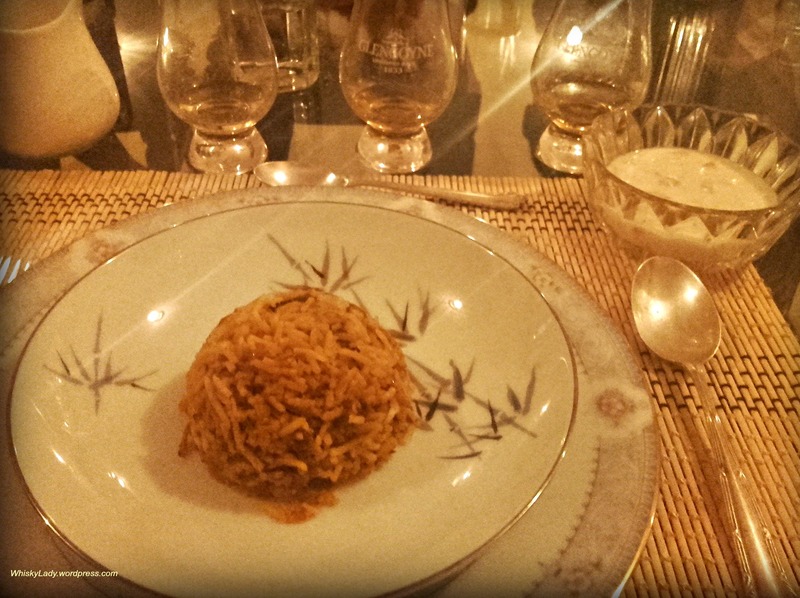 The delight with the next course was the contrast between the hot biryani and the cold raita. Again we tried different combinations with the whisky. For some, it went best with the bourbon, others the sherry. Interestingly none would chose to pair this dish with the PX. In both cases, zero doubt on the whisky pairing choice – the PX. The salty sweet combination of the honey drizzled parmigiana paired beautifully with it. As it did with the sinful chocolate too! 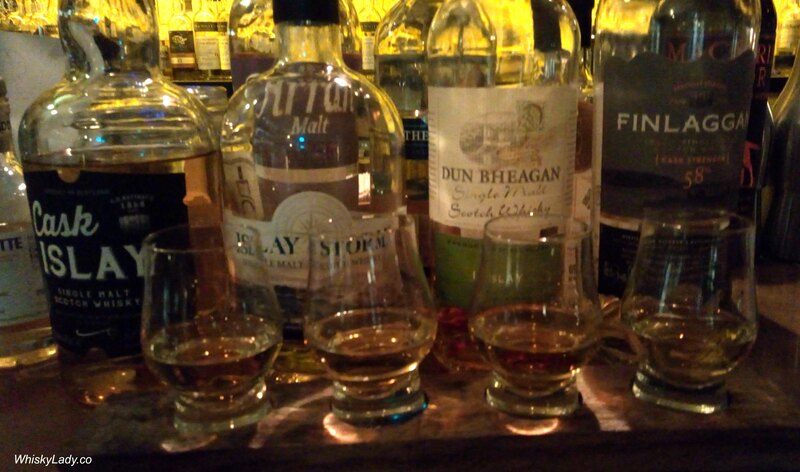 We’ve had the pleasure of sampling several Kilchomans….